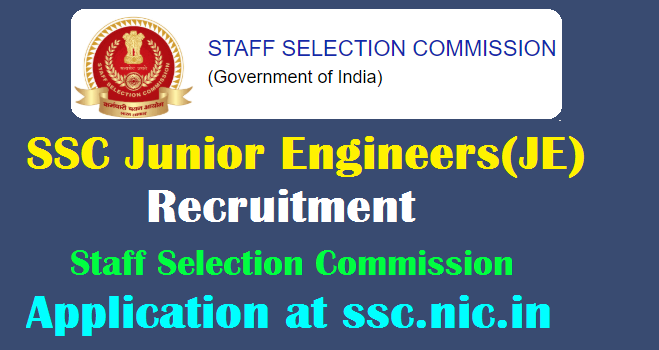 SSC Junior Engineers(JE) Recruitment 2019 Application Begins Online at ssc.nic.in, vacancies, eligibility, exam dates, last date to apply online get details here: SSC JE Recruitment 2019 online application has begun. 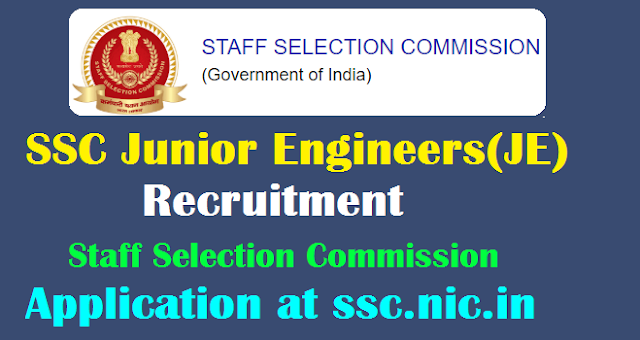 The Staff Selection Commission, SSC has issued a notification for junior engineers (civil, mechanical, electrical and quantity surveying and contract) recruitment examination 2019 on its official website. The posts are Group B (Non-Gazetted), in Level- 6 (Rs. 35400-112400/-) of pay matrix of 7th Central Pay Commission. The number of vacancies has not been released yet and will be announced in due course of time. The SSC Junior Engineer (Civil, Electrical, Mechanical, and Quantity Surveying and Contract) Examination 2019 will be conducted in September 2019. The application process for the examination will continue until February 25, 2019. Candidates should opt only for posts for which they have the qualification and are within the prescribed age limits. The computer-based objective type examination (Paper 1) for these posts will be held from September 23 to September 27, 2019. The Paper II (written examination) will be held on December 29. The number of vacancies will be determined in the due course. It should be noted the examination is being held to recruit both male and female candidates but only male candidates are eligible for the posts of Junior Engineers in Border Roads Organisation (BRO). Reservation for Scheduled Caste (SC)/ Scheduled Tribe (ST)/ Other Backward Classes (OBC)/ Economically Weaker Sections (EWS) and Persons with Disability (PwD) etc would be as determined and communicated by the Indenting Ministries/ Departments/ Offices, as per extant Government Orders. Junior Engineer being a Group „B‟ post, there is no reservation for Ex-Servicemen (ESM) category. However, benefit of age-relaxation will be admissible to ESM candidates, as per extant Govt. Orders. Based on the post applied for, candidate should either have a degree or a diploma in a relevant branch of engineering. Candidates are advised to go through the eligibility requirement section first in the official advertisement and then begin the application process. Certain posts advertised in this recruitment also require a candidate to have work experience. Upper age limit for posts in Department of Posts is 27 years. Upper age limit for posts in Central Water Commission, and Central Public Works Department is 32 years. Upper age limit for posts in all other departments is 30 years. Candidates should refer to the official advertisement for age relaxation norms. The application fee to apply for the recruitment exam is Rs 100/-. The application fees can be paid both online and offline mode. The examination will be conducted in two phases- Paper I will have 200 marks questions and Paper II will have 300 marks question. Candidates with Diploma or engineering degree can apply for the examination. For more information, candidates can visit the official site of SSC at ssc.nic.in or can check the short notice released. The Paper 1 exam will be of 200 marks, two hours duration and of objective nature. The candidates will get questions of 50 marks on general intelligence and reasoning, 50 marks on general awareness and 100 marks on general engineering (civil and structural) or general engineering (electrical) or general engineering (mechanical). In the general engineering section, candidates will be required to attempt only the part as opted by them during filling of the application form. Candidates will lose 0.25 marks for each wrong answer. Candidates who clear the computer-based examination (Paper-I) will be called for the conventional type or written examination (Paper-II). Candidates will be shortlisted and recommended for appointment on the basis of their total marks in the Paper I and II and their preference for the posts. Step 1: Visit the Staff Selection Commission (SSC) official website ssc.nic.in. Step 2: Login to apply for the Examination with Username (Registered Email ID) Password (SSC Registration Password) For New User register Online and login. Step 5: Download your application form. Step 6: Take a print out of it for future use. Last date to submit the online application for SSC JE post is February 25, 2019.